IAMQC Expert is an interactive system that helps frontline laboratory staff select QC rules, reduce unnecessary repeats and make meaningful QC decisions. IAMQC Expert creates graphical color-coded representations of accuracy and precision, illustrating performance relative to target values and error limits. Interactive modules such as ‘Reagent Verification’, ‘Calibration Check’ and ‘Mean Shift Analysis’ assist with problem solving and decision-making. IAMQC Expert allows the end-user to monitor method performance relative to clinical requirements and focus on the tests that require their attention. 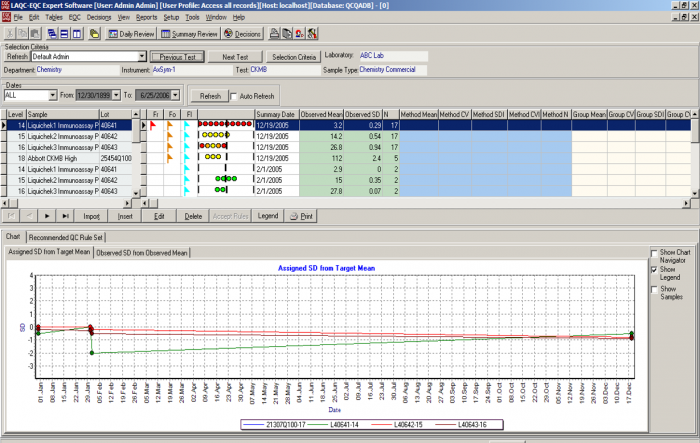 The system can also be integrated with IAMQC Daily to automatically capture summary data for analysis. 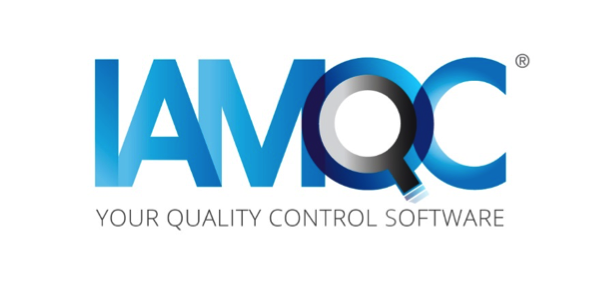 Upon entering the IAMQC Expert database, the software automatically analyses the data and suggests QC rules to maximise true rejects and minimise false rejects. Times and technologies are changing rapidly. Instruments and methodologies are more accurate, precise and stable than they were a decade ago. Most laboratories have adopted these new technical advances, but few have modified their QC processes to match. Many laboratories are still using a 1-2s rule as recommended by Levey and Jennings in 1951. In 1981 Westgard recommended using a multi-rule algorithm to avoid the false positive flags inherent in using only a 1-2s rule. Technology has come a long way since 1981, and for the past ten years industry leaders such as James Westgard, Per Hyltoft Petersen and Callum Fraser have advised the use of a variety of QC rules to match the analytical capability and stability of each test. With the dramatically improved precision of today’s methods, we now see shifts of several SD for the same control on the same test from time to time within a single laboratory. We have designed a QC system that will alert users to significant changes and not generate QC flags when the system is operating safely within acceptable limits. The system compares method performance to defined quality requirements (rather than to last month’s data) and recommends QC strategies that will warn users when QC data points exceed acceptable performance - with a minimal number of false flags. In the design of our QC system we “balance” the quality control system to meet the changing performance and stability of the analytical system. Our analytical processes also vary in their susceptibility to the occurrence of significant errors. Error rates vary from low to moderate to high, depending on the frequency of significant errors that occur in a specific test system. Some methods seldom encounter significant problems. Others are susceptible to relatively frequent sources of significant error. Methods with high error rates frequently see significant shifts in the mean or have on-going precision problems; these methods may also be susceptible to frequent instrument breakdowns or problems. We monitor method performance (accuracy and precision) relative to a quality requirement by calculating critical systematic error (^SEc). Critical systematic error is an extremely powerful and useful statistic. ^SEc indicates in one number how method accuracy and precision compare to the target and TEa limit set for each control. ^SEc indicates the number of standard deviations the mean can shift before the results will exceed error limits. Therefore changes in either the mean or SD will be reflected in a change in critical systematic error. Our QC system has an improved error detection process when methods are close to the error limit (have a low ^SEc) or when methods have poor stability and are prone to errors. In this case we will select a higher number of controls or run our existing controls more frequently and we will select QC rules that are more powerful when assessing small changes in method performance. When the ^SEc is high (method performance is well within quality requirements) and the analytical system is stable, we will run fewer controls or run controls less frequently and we will select QC rules to minimise false QC flags. Critical systematic error is a valuable indicator of the size of the shift in the mean that we must detect. We can easily visualize how it would be appropriate to use “tighter” QC rules when the method is closer to the error limit and to use “looser” QC rules when a method can shift many standard deviations before exceeding the quality requirement. When we run more levels of controls or run the same controls more frequently, we increase our probability of detecting errors. Unfortunately, we also increase the probability of false rejection. Remember, if we are using a 1-2S rule, we will see 5% of our “good” data falling between 2 and 3 SD. Therefore, the more controls we run, the higher the probability in any given run that one of them will fall outside two standard deviations. When it is necessary to design a QC process to detect a very small change in the analytical system, one of the strategies we can use is to increase the number and frequency of the controls. IAMQC Expert is a user-friendly interactive expert system that helps front-line laboratory staff select QC rules, reduce unnecessary repeats and make meaningful QC decisions. The software creates graphical colourcoded representations of accuracy and precision illustrating performance relative to target values and error limits for several departments or groups of affiliated laboratories. Interactive modules assist with problem solving and decision-making. 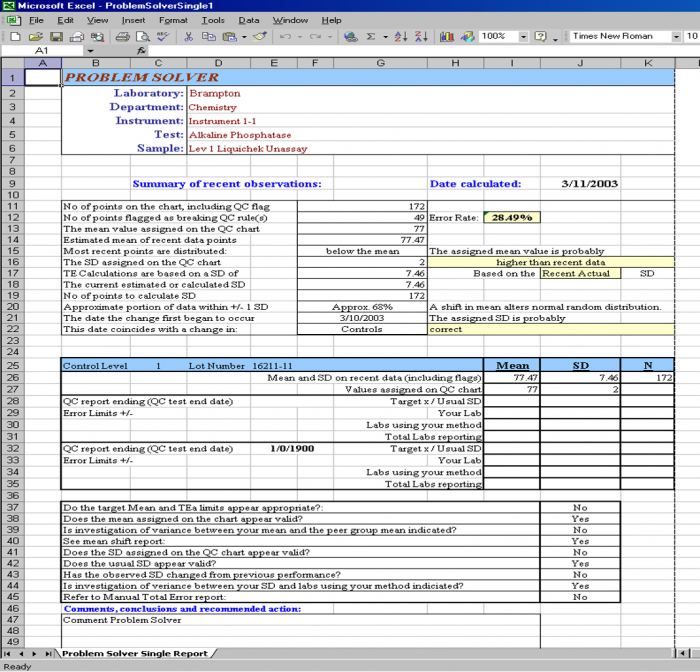 Works with multiple Sites, Departments, Instruments, Tests and Levels. Recommends QC rules for IAMQC™ Daily software. Integrates with various Laboratory Information Systems and/or instruments. Works on a single PC, LAN, WAN, and over the Internet. Runs on a powerful Database Management System. For more information on ordering IAMQC™ Expert or to request a demo, please contact iamqcsupport@technopathcd.com.